After giving out a tart statement in which he vigorously arraigns Colonel Thomas B. Felder, Police Chief James L. Beavers Monday morning announced that he would at once go before the Fulton county grand jury and insist upon a thorough investigation by that body of the charges which have been made against Colonel Felder, Mayor Woodward, E. O. Miles and C. C. Jones. Chief Beavers declared that he would also urge the grand jury to make searching inquiry into Colonel Felder’s charges that graft and corruption exists in the police and detective departments and would ask that the grand jury thoroughly investigate Colonel Felder’s allegations that both he (Chief Beavers) and Chief Lanford are guilty of acts involving moral turpitude. Chief Beavers will carry the matter to the grand jury in person. He will lay before that body all of the affidavits in his possession as well as the records of the dictograph which are sworn to, and will also invite the grand jury’s attention to Colonel Felder’s charges against himself, Chief Lanford and the department in general. This announcement by Chief Beavers has created another sensation and a grand jury probe will be awaited with great interest by the public in the hope that the surcharged atmosphere may be clarified. It was rumored Monday that friends of Colonel Felder would seek to have the board of police commissioners investigate Colonel Felder’s charges of corruption in the police department. Colonel Felder would not indicate what his plans are, but it is believed that he is gathering material for another statement and that he will give one out within the next few days. Colonel Felder declared that he was receiving hundreds of letters, telegrams, telephone messages and personal calls in which he was being assured of the confidence and esteem of the public. He indicated that that situation would very shortly take a decisive turn. Mayor Woodward has issu[e]d a statement in reply to Chief Beavers which is published below. “As for Colyar, I never heard of him until this thing came up. He may be a crook. As far as I know, it seems that Mr. Felder has known him for a long time, but is no uncommon thing for one crook to turn up another to the police, or turn state’s evidence. “When I heard of this deal that Mr. Felder was trying to make in the Phagan case, I told Chief Lanford to advise with Solicitor Dorsey and get his advice in the matter. He did this. I did not want anything done that would not be perfectly legitimate. “G. C. Febuary, who is a trusted man in the detective department, was instructed to carry out the deal with him. Now it appears that Mr. Felder has been closely associated with Colyar for a long time and certainly should have known what manner of man he is. “If he knew him to be a crook, why did he enter into a deal like this with him if he wanted to do the straight thing? I say that I never heard of this man Colyar, but I would have listened to any report or rumor in hunting for the guilty party in a case like that of the Phagan murder. “It seems that Mr. Felder in his ramifications through the press tries to get eloquent and undertakes to tell about the government of Scotland and the conditions in Ireland, as if that had anything to do with this case he’s trying to distract attention from. “What he has done and as far as his evidence he claims to have about my moral turpitude as chief of police or as a citizen, I defy him to show anything wrong. If he is a good loyal citizen, which he claims to be, why did he not go to the police commission and lay the evidence before them? “Now Mr. Felder knows well enough that if he had anything that would have been damaging against the police department he would have hurried to bring it to the proper authorities. “That is what you are hired to do by a gang you are very close to. “I would say that some one has been misled by Mr. Felder, or no doubt he would be in South Carolina today where he belongs. “So much for Mr. Felder. “I see that Mr. Woodward says he has nothing against me personally. Now I don’t’ quite understand his connection with the Felder-Colyar affair. He knew that G. C. Febuary was a trusted employe of the police department and if Febuary knew of crookedness or graft in the department he would have forced him to divulge it or seen that he was turned out of the department. “If Febuary had known anything of the kind and had not make it known he would have been equally guilty. “Mr. Woodward knows that in the frequent talks with me since he has been mayor there has hardly been a time that he did not bring up the question of the red light district, and he gave me to understand in his first talk with me that these women should be allowed to go back to Manhattan avenue where they had previously piled their nefarious trade. “No longer than last Saturday a week ago he asked me if I was willing for Eva Clark and her mother to move into a house on Armstrong street in front of the Grady hospital, where they had previously lived. “I told him I would answer him as I did Alderman McClelland; that it was none of my business as long as she did not violate the law, but that if she did she would have to take the consequences. Mr. Woodward also told me the first of the year that if my vice policy was continued the police department would be reeking with graft like the New York department. “I told him that no graft had ever existed and I was satisfied there would never be any. “I told him that from what I had heard someone outside the police department had been receiving money from the vice traffic that virtually amounted to graft and extortion. “In the first place I want to say that I dislike to go into the newspapers with a statement concerning the head of a city department. In my statement in The Journal Sunday morning I said that I didn’t want to get into a newspaper controversy with Chief Beavers. I said nothing in that statement to offend the chief. “Now, as to the chief’s statement this morning. Eva Clark called me up over the telephone last Friday a week ago, I think it was, and asked me if it would be all right for her to take up her residence on Jenkins street. I believe the number was 95. She said she was going to take her mother to live with her. “I told her if she conducted herself properly and violated no law, and if the neighbors made no objection, I could see no reason to the contrary. She had to live somewhere. But I told her that first I would take the matter up with Chief Beavers. “I asked him to come to my office, and he came the next day, Saturday morning. I laid the matter before him just as I’ve stated it above. “He told me practically what I told her, namely, that if she conducted herself properly, and didn’t violate the law, and if the neighbors didn’t object, he could see no reason for her not to live there. In fact, he said that so long as she did this, he would have no authority to remove her. But he said (and I, of course, agreed with him) that if she went there and started a disorderly house, then he would close her house at once. “That was all there was to it so far as I was concerned. I placed the matter entirely in his hands. And that has been my attitude all along in this vice crusade. I’ve left it up to him. I haven’t put a straw in his way. I haven’t hindered him and I haven’t helped him. I’ve left it for him to handle. “I don’t intend to interfere with his program in the slightest. Except this, that I have tried to insist with him that he ought to clean up the central part of town, whatever else he did, so that ladies could walk the streets without being insulted. “The public demands this of Chief Beavers, as well as myself. “Now, as to February. The same thought occurred to me, while we were talking over there in the Williams house, that the chief suggests. That is, I thought to myself, that if February was telling the truth when he charged graft in the police department, he ought to be forced to follow the matter to a finish. “The only thing that kept me from having him arrested then and there was that I didn’t want to do the police department an injustice. I was willing and wanted first to give him an opportunity to show what he had in the way of evidence. “I knew that by waiting I’d find out whether he had evidence, or whether he was being used as a tool by his superior officers in a plot of some kind. “So directed him if he had any evidence to turn it over to Mr. Ed Miles. “if I had thought that was to be our last meeting, you may be sure he wouldn’t have got away. I would have had him taken in custody right then, and made him show what he had, or else confess that he was lying. “If February went into this thing on his own motion, knowing there was no evidence of graft, then he ought to be discharge[d] for slandering his department. 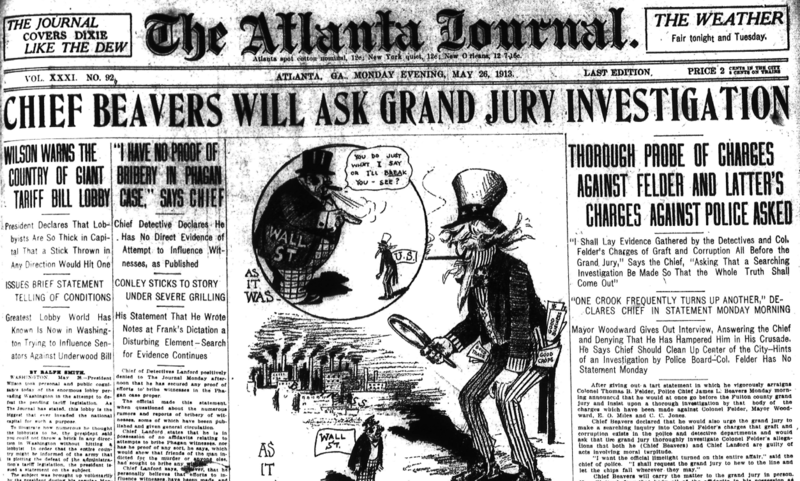 Solicitor General Hugh M. Dorsey refuses to make any statement relative to the grand jury and the Felder-Beavers-Lanford-Woodward-Colyar controversy. Mr. Dorsey retains his same attitude and says that all matters that come to him through the proper channels are investigated and the name of every person properly committed to the grand jury is put before it. In the course of his conversation with a reporter, however, Mr. Beck referred frequently to action taken of its own initiative by past grand juries on which he has served. Although it is customary for the grand jury to meet each Friday on routine matters, the criminal division of the superior court, Judge L. S. Roan presiding, is in session this week, and for that reason the solicitor general, when the jury adjourned Saturday, stated that there would be no meeting this week unless a matter of which then had no knowledge necessitated a called meeting.